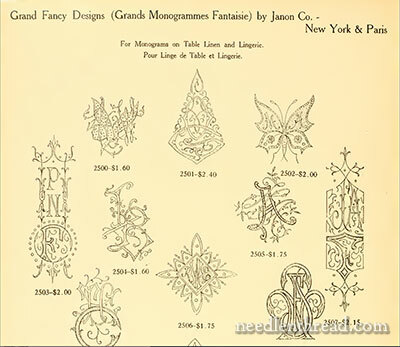 Over at Internet Archive, there’s a lovely old catalog that fans of monograms will want to download and enjoy! 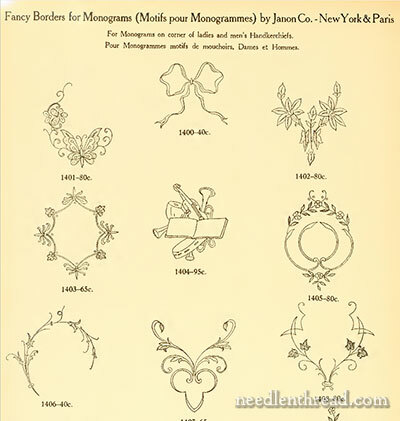 The catalog includes some really nice alphabets and monogram devices, along with some other embroidery patterns. Many of the alphabets presented range from very small and tiny to a little bit larger, and few of the alphabets are completely represented (that is, not all the letters are necessarily there – as is normal with these old collections). At the end of each page of alphabets, you’ll find larger samples of the letters. 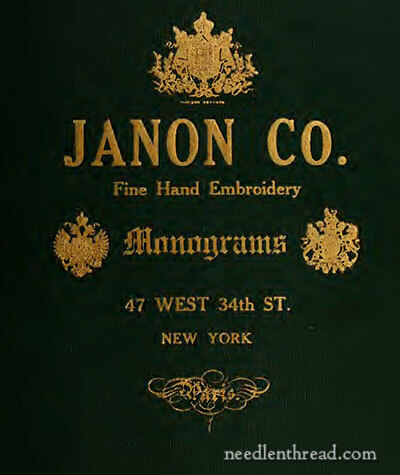 If you view or download the Janon Company Monogram Catalog in PDF format, you can zoom in on the letters and get a fairly clear image of the various letters in the various alphabets. It’s a nice resource for a variety of alphabets! 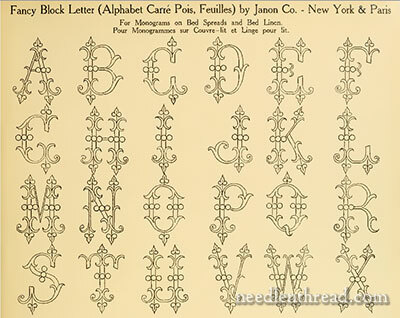 In addition to the alphabets, you’ll find lots of patterns for decorative devices for monograms. These are the “frames” that are often found around fancy monograms, and there’s a whole variety of them in the catalog! Here’s one a little closer up. This is not a pattern catalog, by the way, where an embroiderer would order actual patterns. Rather, it’s a catalog for the customer to choose embroidery designs that the company would then execute. Why am I sure of this? A $2.40 price tag for just a pattern alone, from a catalog that’s clearly early 1900’s or earlier doesn’t make sense. Keep in mind that the average wage in the US was 22 cents an hour in 1910. Embroidery patterns would definitely not have been priced at about 10 hours of labor for the average person! That would be like the minimum wage earner of today paying around $75 for one embroidery design. 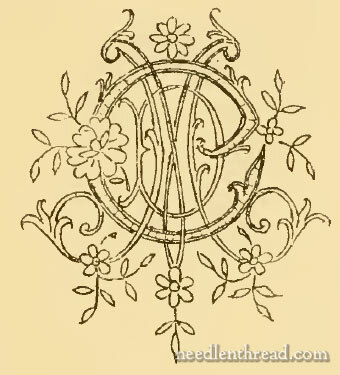 At the end of the catalog, there are some individual non-monogram-related designs, including church embroidery designs. So hurry on over the Internet Archive and browse through the book to see if there’s anything there that inspires you! You can also open the PDF here and save it to your own computer for future reference, too. I hope you had a great Christmas. 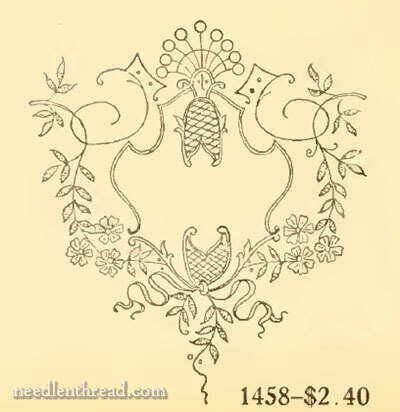 I have just had a look at the book and downloaded it for future reference, thanks so much for letting us know about it, it has some lovely monograms and motifs so I shall certainly look to embroider in the future. Thanks for sharing. Love this posting! I’m a huge fan of monogramming but just like most embroiderers, not enough time in the day for stitching! Thanks for the link. This is such a great group of Monograms. I am sure that it will be used by me sometime in the future. I love all the different styles of the past. Thank you so much for bringing this to us. Yes, prices have changed! The times are given away by the listing for a “carriage robe” monogram. I enjoyed viewing this piece of history. Thanks Mary. Mary, Many thanks for this awesome resource. You are such a sweetheart! I absolutely love these old gems! Thank You! Am really looking forward to next year! Have an awesome New Year’s! and be blest in all things! Dear Mary, I bought a lovely bath towel prior to Christmas and embroidered my granddaughter’s first two initials on the deep border. Her parents were very pleased to see I had made it into something special. The book I used was “Charted Monograms for Needlepoint and Cross-Stitch” edited by Rita Weiss. Rita over-lays the letters but I just embroidered the two initials separately. Not too challenging but highly effective and the gift was doubly appreciated. Very glad to hear your Christmas meat pies were well received too. You home looks a picture! Thank you Mary. These are gorgeous monograms and the extras are very pretty too. I can see them being used for all sorts of things. I love these old books and obviously you do too. Dear Mary, Thank you for this resource; it’s just what I was needing. I’ve downloaded it, found just what I want, and am preparing to stitch it. As I continue to listen to Christmas music (http://www.king.org/The-Christmas-Channel/15158779)while tra-la-ing through stitchery this fourth day of Christmas, I think of the lovely pieces and splendid knowledge you have gifted to us throughout the years. I am most grateful. Merry Christmas, Mary! Thank you for sharing. I would never find this without you. I have from my grand-mother copper plates with very similar patterns with her initials on them. I know I’ll use this resource at least once. Have a nice end of 2013. This is a lovely book of monograms, thank you so much for sharing. Previous Previous post: This is Not an Embroidery Book … Or is It? Next Next post: The Art of Chinese Embroidery – Give-Away Winners Announced!